Our oxygen based water treatment program uses technology that has been proven on thousands of pools and is guaranteed to keep your pool water fresh, clean and safe. The Gentle Oxygen Based Alternative to Chlorine Pools! Revolutionary Water Treatment For Residential Pools. Now With 40 Million Gallons of Pool Water Under Treatment! To Salt Chlorine Pools and Standard Chlorinated Pools! Welcome to our website where you’ll find real answers to your questions about oxygen based water treatment for your residential pool. At Oxygen Pools, we have families just like you and our first concern is the safety of everyone who swims in a pool. So we developed our oxygen based program to be gentle on humans but extremely aggressive against the “bad guys” that can live in water. An Oxygen Pool is clean, clear, safe and affordable . After learning how an Oxygen Pool works, we hope you’ll join our family of poolowners who are swimming in the most amazing water you’ve ever seen! Our oxygen based water treatment program is being used on thousands of residential pools with millions of gallons of water and are so clear and so fresh that most Oxygen Pool owners tell us their water has never looked so great. We do this by creating multiple layers of oxidation in the water. These layers include direct oxidation with O3 oxygen and a safe level of residual hydrogen peroxide for an Advanced Oxidation Process that is unmatched in its ability to oxidize contaminants in water. 1.) First, the Oxygen Pools Dynamic Oxygen Generator automatically oxidizes contaminants in the water as it feeds ozone into the pool water. 2.) Simultaneously, our patented high-velocity generating system creates a safe residual level of hydrogen peroxide in the water. This is accomplished automatically whenever the generator is running and is measured using test strips. 3.) Shocking your pool weekly plays an important part in maintaining healthy water. Chlorine free Formula “O” simplifies your water treatment program by replacing the need to add multiple chemicals every week. This EPA registered product is added weekly and contains activated oxygen, algaecide, clarifier, stain and scale prevention, all blended together to shock the water and keep it fresh and clear. Because the Formula contains no chlorine, you can swim in minutes after dosing! You’ll see the difference immediately in water quality and clarity. There’s nothing that looks and feels like an Oxygen Pool! Oxygen Pools 4 way test strips are the easiest way to measure your pool water for safety. The test strips measure levels of Peroxide, Total Alkalinity, pH and Total Hardness. Just dip and compare colors on the vial. 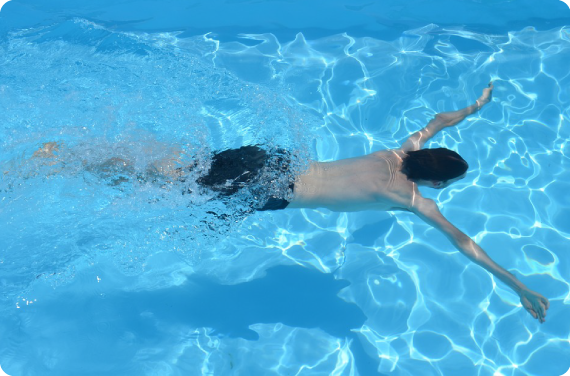 As the Oxygen Generator creates a safe level of hydrogen peroxide residual in the pool, the first thing most swimmers notice is the silkiness and comfort of the water. The reason is that a proper level of hydrogen peroxide is the most compatible oxidizer for the human body in pools. In fact, our bodies create peroxide every day! Biologically, hydrogen peroxide is produced inside human cells as a first line of defense against pathogens so it is not a foreign substance to humans in the ways that chlorine is. The difference is immediate and noticeable. Although most pool owners are willing to pay more, Oxygen Pools are very affordable. One weekly dose of our Formula “O” does the work of multiple water treatment products. *Costs comparison per manufacturer’s instructions. Results may vary based on bather loads, weather conditions, pool equipment and diligence of pool caretaker. We’re so sure you’ll love the Oxygen Pools Water Treatment Program, that we want you to use it for 60 days and, if you’re not thrilled with the quality of your water, you can return the generator for a full refund. We love working together with our customers to make sure you’re satisfied. How difficult is it to switch to an Oxygen Pool? If you’re using chlorine now or if you have a salt pool, there is no conversion process. No need to neutralize the pool from what you’ve been using or wait for days to swim. Just start using the oxygen based program and you’ll be swimming in an Oxygen Pool within days. Order your system now and get a 10lb pail of our non chlorine Formula “O” for FREE! See what real users are saying!